Are you talking about the color table codes? I made a different color table looks close to baron but custom. Thanks again for trying to help, I made the color table and it looks good. Have a nice day! I saw that website a while ago, I was trying to make this color table and I really would like to use this one. Hello I was wondering if you have any of the following color table codes for the following pictures? (Base Reflectivity) because I am not good with making color tables. Please Help, there aren't many people here in San Diego CA who have this program to teach me how to make the following color tables. (Base Reflectivity only or picture on left. I talked to him and he said that he is going to give out a huge discount only on the release date. I am for sure going to try the trial and maybe buy it. There will be an announcement Friday night about prices and more. Possible strong/super El Niño forming? Well a El nino might be a little too much rain here in san Diego CA, we do need the rain but not that much, last El Nino we had flash flooding and that one wasn't too strong. But if it becomes a strong El Nino then we are in trouble. I am going to watch the Models for updates. Confirmed Tornado located near Cisco TX, Look at that hook echo. I can say that I am a little disappointed... however, lets see how it plays out. Yeah they just fixed it. DAY 2 CONVECTIVE OUTLOOK NWS STORM PREDICTION CENTER NORMAN OK 1230 PM CDT WED APR 08 2015 VALID 091200Z - 101200Z ...THERE IS AN ENH RISK OF SVR TSTMS THURSDAY AFTERNOON AND EVENING ACROSS PARTS OF SOUTHERN GREAT LAKES REGION AND LOWER OHIO VALLEY...SOUTHWARD THROUGH THE OZARK PLATEAU AND ARKLATEX REGION... ...THERE IS A SLGT RISK OF SVR TSTMS SURROUNDING THE ENH RISK AREA...ACROSS THE GREAT LAKES REGION AND OHIO VALLEY...SOUTHWARD INTO THE SOUTHEASTERN PLAINS... ...THERE IS A MRGL RISK OF SVR TSTMS AS FAR SOUTHEAST AS THE EDWARDS PLATEAU AND ADJACENT PORTIONS OF THE RIO GRANDE VALLEY... ...SUMMARY... SEVERE THUNDERSTORMS ARE LIKELY THURSDAY INTO THURSDAY NIGHT ACROSS SOUTHERN PORTIONS OF THE GREAT LAKES REGION...AND MUCH OF THE MIDDLE MISSISSIPPI AND OHIO VALLEYS INTO THE SOUTHEASTERN PLAINS. THIS WILL INCLUDE THE RISK FOR DAMAGING WIND GUSTS AND LARGE HAIL. A COUPLE OF STRONG TORNADOES ARE POSSIBLE. ...SYNOPSIS... A SIGNIFICANT IMPULSE...WITHIN THE SOUTHERN BRANCH OF SPLIT WESTERLIES EMERGING FROM THE MID-LATITUDE PACIFIC...IS FORECAST TO CONTINUE AN EAST NORTHEASTWARD ACCELERATION OUT OF THE GREAT BASIN DURING THIS PERIOD. THIS FEATURE IS EXPECTED TO REACH THE CENTRAL HIGH PLAINS BY 12Z THURSDAY...AND THE UPPER MIDWEST BY THURSDAY NIGHT...WHERE/WHEN MODELS SUGGEST THAT IT MAY INCREASINGLY PHASE WITH A SIGNIFICANT NORTHERN STREAM IMPULSE. AS THIS OCCURS...MORE SUBSTANTIVE DEEPENING OF AN ASSOCIATED SURFACE CYCLONE...EMERGING FROM THE CENTRAL PLAINS...IS EXPECTED TO PROCEED ACROSS AND EAST NORTHEAST OF THE GREAT LAKES REGION. ALTHOUGH SUBSTANTIVE DEEPENING OF THE LOW IS NOT CURRENTLY FORECAST AS IT TRACKS FROM THE MID MISSOURI VALLEY TOWARD LAKE MICHIGAN DURING THE DAY THURSDAY...IT STILL IS EXPECTED TO BE AT LEAST MODERATELY STRONG WITH LOWEST PRESSURES AT OR BELOW 1000 MB. 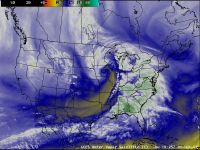 A TRAILING SURFACE COLD FRONT APPEARS LIKELY TO ADVANCE SOUTHWARD THROUGH THE MIDDLE MISSISSIPPI VALLEY AND PORTIONS OF THE OZARK PLATEAU AND SOUTHEASTERN PLAINS...WHERE IT WILL GRADUALLY OVERTAKE A WELL-DEFINED DRYLINE. A WARM FRONT EAST OF THE LOW APPEARS LIKELY TO ADVANCE NORTHWARD THROUGH THE GREAT LAKES REGION...WHILE COLD AIR REMAINS DAMMED TO THE EAST OF MUCH OF THE NORTHERN AND CENTRAL APPALACHIANS. AIDED BY THE PRESENCE OF MOIST AND POTENTIALLY UNSTABLE AIR IN THE WARM SECTOR OF THE CYCLONE...LARGE-SCALE FORCING FOR UPWARD VERTICAL MOTION SHOULD BE SUFFICIENT TO SUPPORT WIDESPREAD THUNDERSTORM ACTIVITY...FROM THE MISSISSIPPI VALLEY AND SOUTHEASTERN PLAINS INTO THE APPALACHIANS...PERHAPS PORTIONS OF THE PIEDMONT TO THE EAST OF THE SOUTHERN APPALACHIANS. IN THE PRESENCE OF MODERATELY STRONG...40-50 KT DEEP LAYER MEAN FLOW AND DEEP LAYER SHEAR...A NUMBER OF THESE STORMS MAY BECOME SEVERE. MUCH OF THIS ACTIVITY SEEMS LIKELY TO BE FOCUSED ON THE AFOREMENTIONED SURFACE BOUNDARIES...PARTICULARLY ALONG THE SOUTHEASTWARD SURGING FRONT/DRYLINE ACROSS THE OHIO VALLEY INTO SOUTHEASTERN PLAINS BY THURSDAY EVENING. ...GREAT LAKES/OHIO VALLEY INTO SOUTHEASTERN PLAINS... MODEL OUTPUT IS SUGGESTIVE THAT DEEPER/RICHER BOUNDARY LAYER MOISTENING MAY BE CONFINED TO A RELATIVELY NARROW CORRIDOR IN ADVANCE OF THE COLD FRONT. AND CONSIDERABLE CONVECTIVE ACTIVITY MAY BE ONGOING IN THE WARM SECTOR ACROSS PARTS OF THE MIDDLE MISSISSIPPI AND OHIO VALLEYS AT THE OUTSET OF THE PERIOD. BY 12Z THURSDAY...IT ALSO APPEARS THAT THERE MAY BE CONSIDERABLE STABILIZATION OF THE BROAD AREA OF STEEP MID-LEVEL LAPSE RATES NOW PRESENT ACROSS THE PLAINS INTO THE VICINITY OF THE APPALACHIANS. THESE FACTORS...AMONG OTHERS...MAY BE LIMITING FACTORS TO A POTENTIALLY MORE SUBSTANTIVE SEVERE WEATHER RISK FOR THIS PERIOD. STILL...GIVEN THE LARGE-SCALE FORCING AND STRENGTH OF DEEP LAYER FLOW/SHEAR...INCLUDING A RATHER BROAD AREA OF 40-50 KT SOUTH SOUTHWESTERLY 850 MB FLOW DURING THE DAY...THE ENVIRONMENT WILL BE CONDUCIVE TO ORGANIZED CONVECTIVE DEVELOPMENT...INCLUDING SUPERCELLS. AND POCKETS OF STRONGER DESTABILIZATION COULD YIELD SCATTERED AREAS WITH POTENTIAL FOR INTENSE SUPERCELLS CAPABLE OF PRODUCING A STRONG TORNADO OR TWO...IN ADDITION TO VERY LARGE HAIL. IT IS POSSIBLE THAT ONE OF THESE AREAS COULD DEVELOP NEAR THE WARM FRONT...IN THE VICINITY OF THE SURFACE LOW...ACROSS PARTS OF NORTHERN ILLINOIS...INCLUDING THE CHICAGO METRO AREA... DURING THE MIDDAY AND AFTERNOON HOURS. ANOTHER COULD DEVELOP NEAR THE COLD FRONT/DRY LINE INTERSECTION...ACROSS PARTS OF THE OZARK PLATEAU AND ARKLATEX REGION DURING THE LATE AFTERNOON AND EVENING. HOWEVER...TOO MUCH UNCERTAINTY CURRENTLY EXISTS CONCERNING COVERAGE AND AREA TO SUPPORT 10 PERCENT SIGNIFICANT SEVERE WEATHER PROBABILITIES AT THE PRESENT TIME. Well the temperatures for Dallas Tx are rising a little this week. Well I hope I don't forget to see this.